Barry Winford once crossed paths with Cal Ripken Jr., his friend Gar Ryness wrote in his book "Batting Stance Guy: A Love Letter to Baseball." It came in spring training 1990, Ryness wrote. Winford, playing for the Rangers spring squad hit a double. Waiting for him at second was Ripken. "They call you Winnie, right?" Ripken told Winford, the story went. Winford crossed paths with Ripken as Winford went into his second season as a pro. Assigned to single-A Gastonia, Winford returned for just one more pro season. 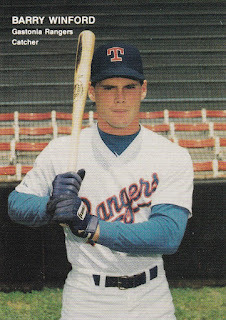 Winford's career began in 1989, taken by the Rangers in the 12th round of the draft, out of Mississippi State University. At Mississippi State, Winford still holds the record for career catching assists, with 110. He was names second-team All-SEC in 1989. Winford singled and scored the game-winning run in an April 1987 game. He then broke his jaw on a play at the plate, but he made it back to the field by that May. Then, he knocked in a run on a double in a contest the next month. With the Rangers, Winford started at rookie Butte. In 61 games, he hit .359. That fall, he went 2 for 2 in an instructional league game. He then moved to Gastonia for 1990. There, he hit just .238 over 96 games. For 1991, Winford arrived at high-A Port Charlotte. He went 1 for 3, with a run scored and an RBI. He hit .216 over 69 games. It was his final year as a pro.